Flowers, the official Class of 2019 commemorative T-shirt, and other gifts will be available for purchase inside HighPoint.com Stadium. Please note that outside flowers may be brought into the stadium. Advance Orders: Preorder flowers or a commemorative T-shirt to speed pickup inside the stadium during University Commencement on Sunday, May 19. Many items that are especially appropriate as graduation gifts are only available as custom orders, so it is wise to allow a minimum of three weeks for delivery. 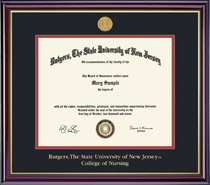 Gift Cards: A gift card to Barnes & Noble at Rutgers bookstore also makes a great gift for graduates and can be used to purchase diploma frames and more.